Beat egg whites till stiff, gradually adding sugar. Fold in remaining ingredients except heavy cream. Bake in shallow pie plate at 325 degrees for 25 minutes or till lightly browned. Add whipped cream. Lightly indent center and fill with strawberries or other fruit. I made this recipe in memory of long-time LBI volunteer, Ruth Heimann, who passed away in late 2012. Similar to a meringue pie, this angel pie was made of beaten egg whites and mixed with crushed Ritz crackers and pecans. 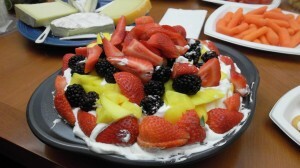 Fresh whipped cream and sliced fruit decorated the top. My assumption was that the final dish was meant to be white and fluffy, reminding eaters of angels. However, the cake I made was not very fluffy, probably because I could not get the egg whites to form stiff peaks while I was beating them. To compensate for the lack of angel-white-fluffiness, I smothered the entire pie in extra whipped cream and brightly colored fruit! The final cake was still delicious and received many positive reviews. The hardest part was not being able to share my “Angel Pie” with Ruth. She always had a good sense of humor and would have probably made a few jokes about what I baked in her memory.